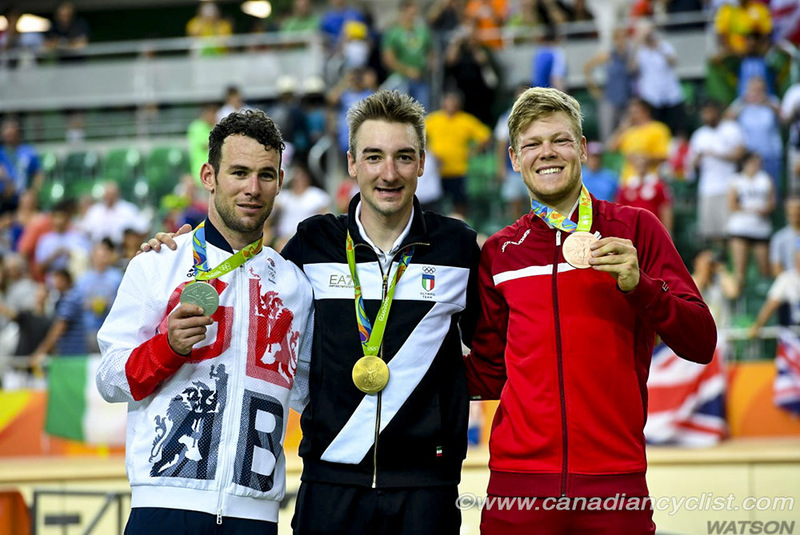 Elia Viviani of Italy won a tight battle for the gold medal in the Men's Omnium at the Rio Olympic Velodrome on Monday, in the only medal contest for the day. Tour de France star Mark Cavendish of Great Britain finished second, and defending champion Lasse Norman Hansen of Denmark won the bronze. At the start of the second day of competition, Thomas Boudat of France led the rankings with 106 points, two ahead of Viviani, and ten in front of Cavendish. Hansen was back in sixth place after a disastrous Elimination Race at the end of Day 1. Viviani moved into the lead after the 1000 metre time trial with a third place result, supplanting Boudat, and further extended his lead in the Flying Lap after finishing second. Cavendish moved up to second after the Flying Lap and Hansen clawed his way back into third. The final Points Race would determine the medalists, and the race became a battle between the three leaders. Viviani consistently held the lead, but Cavendish was chipping away at it with each sprint for points, while managed to take a lap on the field, pulling even with the British rider. Then the Italian went down in a hard crash, but managed to rejoin the race before losing the lead. 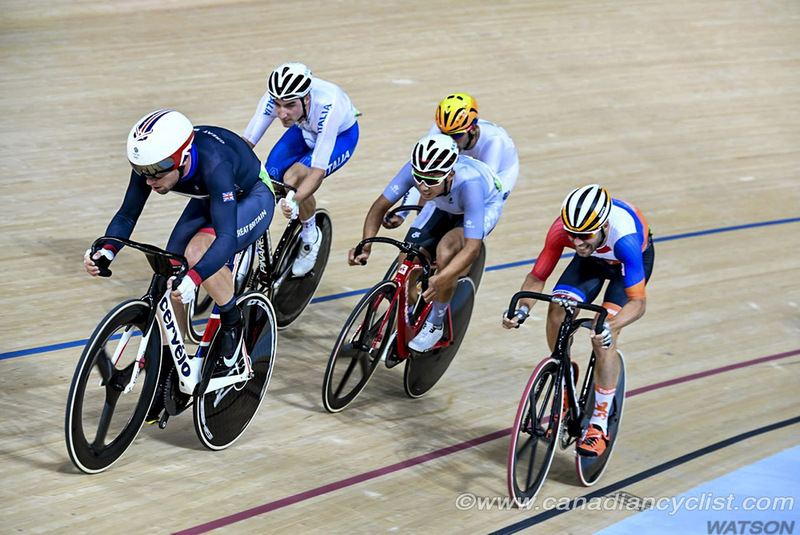 As the number of laps shrank, it became apparent that Viviani would hold on for gold, finishing with 207 points, but the battle for silver continued until the final sprint, when Cavendish finally prevailed by only two points; 194 to 192. 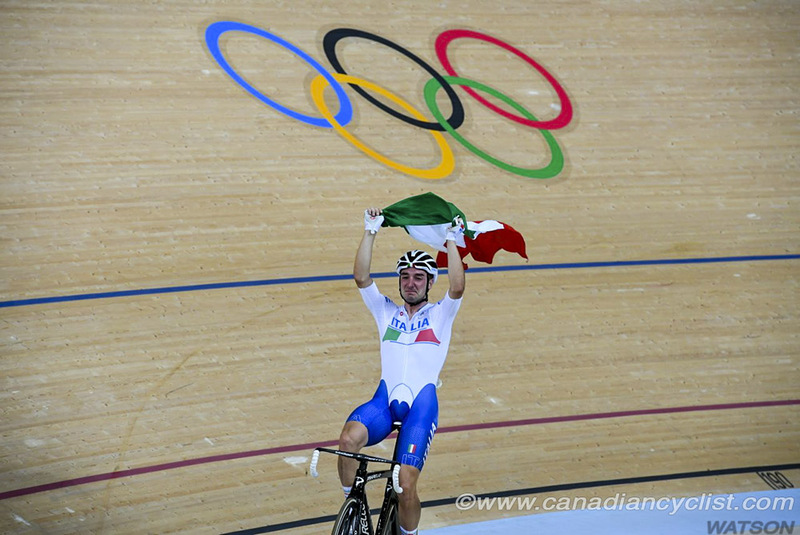 The Italian rode around the track after the finish with his arms in the air, and then wept in the arms of his coach. "It's unbelievable, I still cannot believe it," said Viviani. "It was the race of my life. It was a very difficult race, because after five races we were all so close, and the Points Race was the most difficult. At every sprint I knew I needed to gain points and with two sprints to go I tried to get the additional points I needed for the title. My coach told me, 'One point. One point and you are the Olympic champion'. I could feel nothing in my legs for the last 20 laps, but I knew that I had the title, so I really enjoyed the final ten laps." "I was beaten by the best guy out there," stated Cavendish. "I was a marked rider when I tried to do anything, but I did everything I could to win the race, I gave everything I had and I couldn't give any more. I'm disappointed it wasn't enough for the win. Elia was the strongest, so hats off to him." The Women's Omnium got underway with their first three events, and defending champion Laura Trott of Great Britain had a strong start with two wins and a second place in the first three events. Trott leads at the end of the first day with 78 points, followed by Sarah Hammer of the United States and Jolien D'Hoore of Belgium, who are tied at 72 points. 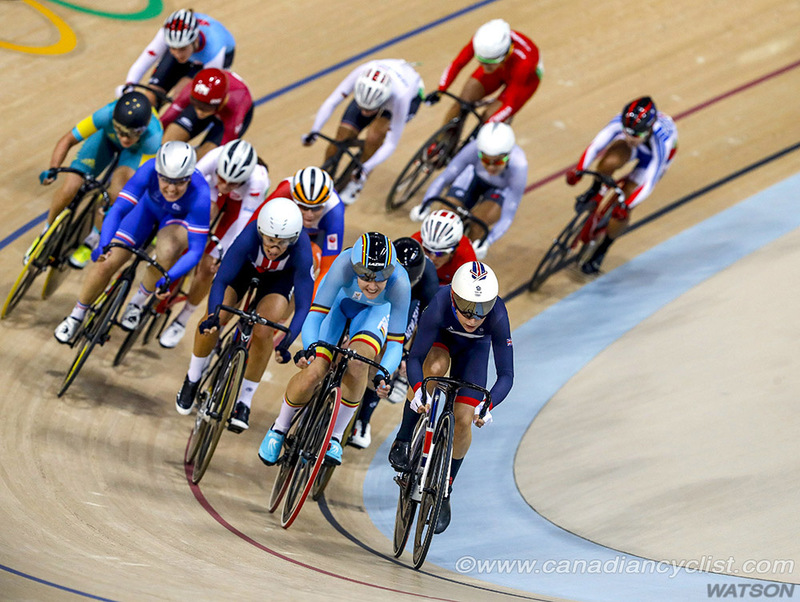 The Women's Sprint competition continued, and is reduced to the final eight riders for the last day of track competition on Tuesday. 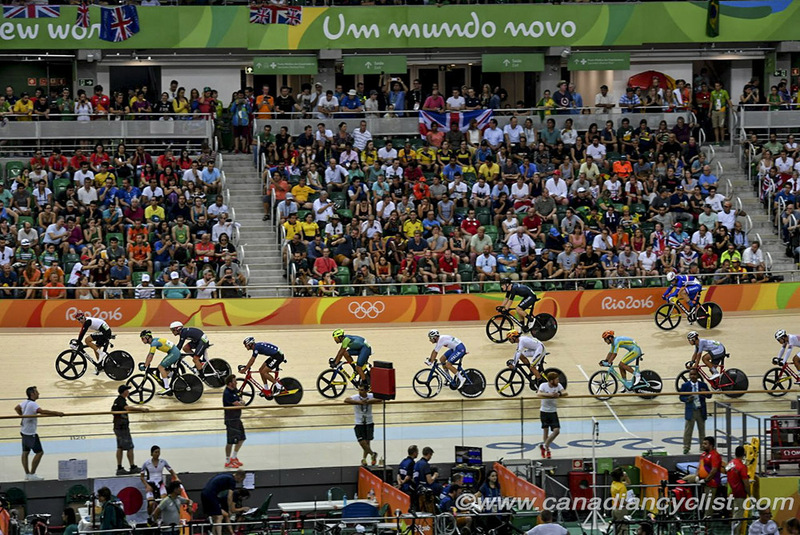 Of special note was the final Olympic race of Australian great Anna Meares, a six time Olympic medalist, who did not qualify for the quarterfinals, and will finish tenth overall in the Sprint, after winning the bronze medal in the Keirin on Saturday.